Well, that rocked. I have to admit, as a lifelong rocker it is too easy to get a bit jaded about concerts sometimes. After having seen dozens and dozens upon dozens of concerts over the last 20 years, too many times I’ve found myself losing that feeling of excitement, the blissful state of physical and emotional euphoria that accompanied my first several — and, usually, favorite — shows. Attending concerts as a teenager and early-20-something metalhead was a much-anticipated, near-religious experience that defined the course of our nascent lives. We pumped our fists with abandon, we headbanged and played air guitar ceaselessly, and we sang along to every word as the musical ecstasy seared and lifted our souls to what was akin to Valhalla on Earth. Then the sense of utter exhaustion and the inevitable emotional letdown would follow us for days or even weeks after the show. Sadly, these emotional extremes became much less intense and palpable for me after seeing many more concerts by many of the same bands over the years. The novelty and the youthful feeling of spiritual exuberance gradually wore off, even though I have certainly enjoyed most concerts I’ve attended. It just wasn’t the same. Then the almighty Diamond Head had to come to town and make me feel like a kid all over again. That’s right, the legendary New Wave of British Heavy Metal band came to Michigan’s capital city and steamrolled through any trace of apathy or jadedness. The original writers of such Metallica-covered classics as “Am I Evil” and “The Prince” left no doubt as to why a young Lars Ulrich would have been so obsessed with an obscure little metal band from England. Brian Tatler & co. towered above their Lansing faithful by playing a grandiose, powerful and magnificent set that renewed this crusty ol’ metalhead’s youthful fervor. First, though, three opening acts raised the metallic boiling point up several notches at the charming Uli’s Haus of Rock bar & grill. Lansing’s own Purgatory Grove kicked off the proceedings with a solid 30-minute set of traditional heavy metal. This quartet exuded the professional playing and bearings of a national act, boasting original songs that resembled the straight-forward U.S. metal of 1980s Metal Blade recording artists such as Omen and Warlord. The tempos weren’t outrageously fast, the riffs weren’t extremely technical, but Purgatory Grove performed with enough enthusiasm to get the already substantial crowd feeling the old-school metal vide. Plus, it was a welcome surprise to discover a traditional metal band like this right here in Michigan. Next up came Past Tense, another band of old-school headbangers from Lansing. I didn’t know what to expect from this quintet, but that didn’t matter as soon as they launched into the crunchy, galloping opening riff of “Holy Wars…The Punishment Due.” The band performed Megadeth’s classic speed metal juggernaut flawlessly, with a perfectly crystal clear and LOUD mix to boot. When they began the palm-muted eighth notes and cascading opening riff of Anthrax’s “Caught in a Mosh,” it dawned on me that “Hey, this is a thrash metal cover band.” How cool is that? It didn’t hurt that the band and the mix sounded better than the real Anthrax on their last tour with Testament. Then Past Tense opened into a phenomenal version of Iron Maiden’s “Powerslave,” and that’s when the feel-good vibe in the Haus of rock really shifted into high gear. Guitarists Richard Bates and Stoney Garza really shined on the harmonies, and vocalist James Vasquez nailed Bruce Dickinson’s high-pitched wails and vibrato. Talk about top-notch. Past Tense kept on steamrolling through Savatage’s cult favorite “Hall of the Mountain King,” (are you kidding me? ), Metallica’s “Creeping Death” and finished with a rousing rendition of Pantera’s “Cowboys From Hell.” This local metal cover band decimated and provided the two upcoming national acts a tough act to follow. Cauldron, a three-piece hailing from Toronto, Canada, proved to be more than up to the challenge. My brother Jeff and I moved up to the first two rows and allowed the aggressive, no frills strains of Cauldron to get the hair-a-flying and the fists-a-pumping. Sporting long brown hair with bangs, looking very much like a young Geddy Lee (oddly, also sporting a Rush “Power Windows” tank top) bassist vocalist Jason Decay anchored the band’s muscular and speedy ensemble sound. I did not know one note of the band’s music, but that didn’t matter one iota as Cauldron steamrolled through their inimitable brand of no-frills, ultra high-energy heavy metal. It’s very difficult to accurately describe Cauldron’s music, and that’s a very good thing. Let’s just say if you lowered this music into a vat, or “cauldron,” if you will, of Motorhead’s relentless sonic assault, Raven’s insane onstage energy and some of the catchiness of vintage Angel Witch or Saxon, you might get some approximate facsimile of Cauldron. At any rate, this band’s set was super infectious and hell of a blast to watch. Cauldron made me an instant fan, and as a fellow aggressive bass player in a power trio, I made sure to say hello to Decay and co. afterwards and tell them so. Before Diamond Head took the stage, band founder and guitarist Brian Tatler walked right past me through the crowd with encased guitar in hand and disappeared through the corridor towards the restrooms and bar/kitchen area. Yes, this would be a good indication this would be a special and intimate gig. Soon enough, the Haus of Rock’s smiling and affable owner, Uli Kaczmarek, appeared onstage and announced through his distinct German accent, “Haus of Rock, please welcome, all the way from the island, England’s own, Diamond Head!” The veteran quintet resolutely took the stage and calmly unleashed the crushing chords of the dynamic, mid-tempo openers “Play It Loud and “I Feel No Pain.” Indeed. One thing that became immediately apparent during this set is Diamond Head’s devastating raw power as a live act. Tatler, sporting jeans and a classy button-down black shirt, delivered a monstrous rhythm guitar sound that nearly stole one’s breath. His guitar tone and volume, not unlike Iced Earth’s inimitable Jon Schaffer, is crystal clear, cutting and LOUD, catapulting DH into the small pantheon of devastatingly-heavy live acts. Overall, the band consisting of bassist Eddie Moohan, drummer Karl Wilcox and guitarist Andy Abberley, sounded tight as a snare head and heavier than most thrash acts. Short-coifed singer Nick Tart presented an affable and relaxed demeanor on stage, but more importantly his pleasing mid-range timbre closely resembles that of original vocalist Sean Harris. The grand total of all these top-notch musical ingredients culminated in one of the most emotionally and physically draining concert-viewing experiences of my life. The Diamond Head machine really upped the temperature in the room with the driving “Dead Reckoning,” and the ethereal, melodic strains of the groovy “In the Heat of the Night” were gorgeous and emotive before the finale of cascading guitar harmonies. “It’s Electric” increased the speed and energy in the club quite a bit, setting the stage for the epic centerpiece “Sucking My Love.” The tune and signature main riff that most likely provided the blueprint for Metallica’s “Seek and Destroy” showcased Tatler’s fleet-fingered yet soulful playing brilliantly, and Tart kept the rabid audience involved (even offering the mic out front to yours truly for a hearty shout of “Sucking My Love” during the chorus) throughout the head-banging sweat fest. Yes, “tasty,” my friends. The better-known tunes kept coming towards the end of the 90-minute show, with “The Prince” and the iconic “Am I Evil” rounding out the regular set. After an obligatory encore break of a few minutes, DH returned to blast out a punishing barrage of brutal riffage known as “Helpless.” We the audience were rendered just that as one of the greatest concerts I have ever seen came to a close. 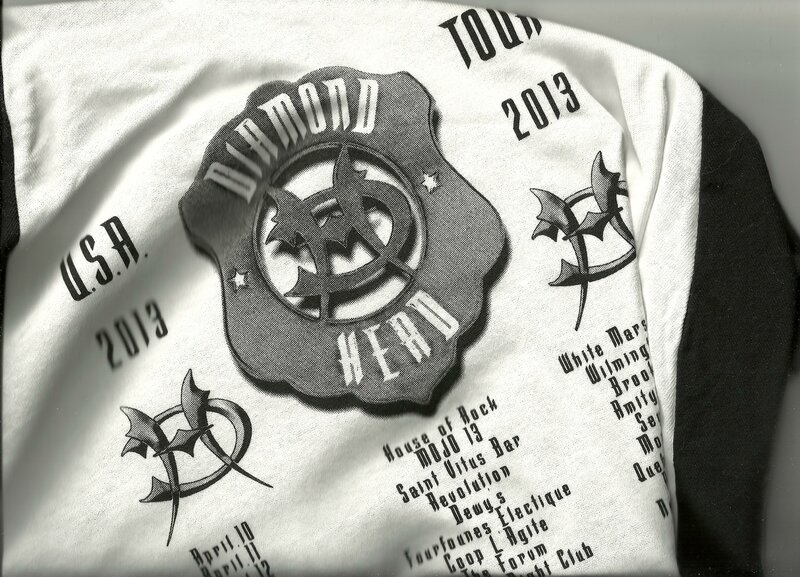 Diamond Head live must be experienced to be comprehended. What I expected to be a once-in-a-lifetime experience really was an exuberant, emotional, dare I say spiritual experience for a lifelong heavy rocker. It also was fun and refreshing to see all the friendly, fellow denim-clad die-hards out there for a good time and a chance to share in the love of amazing music. I’ve seen lots of shows over the years, but Diamond Head at Uli’s in Lansing on April 20, 2013 ranks among my top-five of all time. ~ by jonnyboyrocker on May 30, 2013. Great review! Our guitar player however, is Richard Bates (not Gates). It’s all good though. Past Tense thanks you very much.